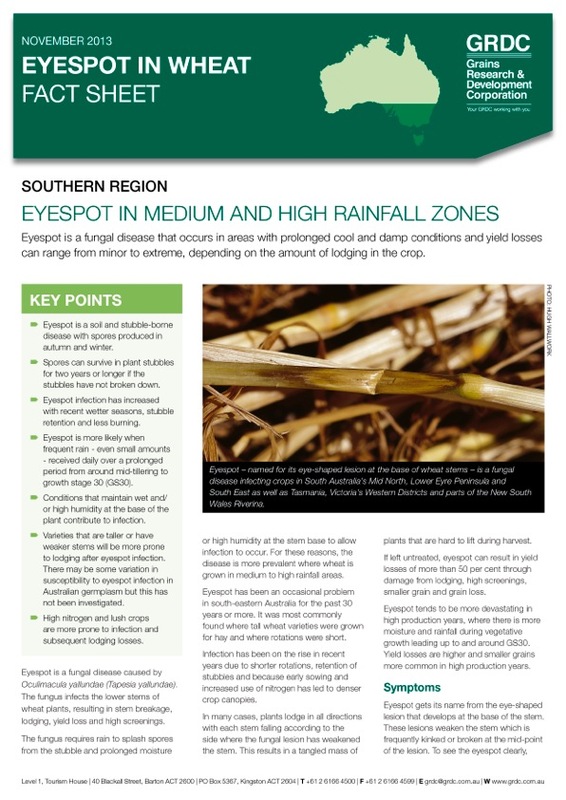 Eyespot is a fungal disease that occurs in areas with prolonged cool and damp conditions and yield losses can range from minor to extreme, depending on the amount of lodging in the crop. Spores can survive in plant stubbles for two years or longer if the stubbles have not broken down. Eyespot infection has increased with recent wetter seasons, stubble retention and less burning. Eyespot is more likely when frequent rain - even small amounts - received daily over a prolonged period from around mid-tillering to growth stage 30 (GS30). Conditions that maintain wet and/or high humidity at the base of the plant contribute to infection. Varieties that are taller or have weaker stems will be more prone to lodging after eyespot infection. There may be some variation in susceptibility to eyespot infection in Australian germplasm but this has not been investigated. High nitrogen and lush crops are more prone to infection and subsequent lodging losses. Use www.grdc.com.au/GRDC-FS-Eyespot-Wheat to ensure your link remains current and up-to-date!